It certainly is a fantastic feeling to have a house in your name, but with that feeling of absolute contentment comes the responsibility of knowing the basic ways to maintain your home. A leaky pipe here or a flowing tap there shouldn’t take away the pride of being a homeowner. Knowing the simplest of tricks can save the day before you call your plumber in a hurry and they charge you a fortune. While there are some plumbing issues that can best be resolved by professional plumbers, for minor issues a toolkit, some preparedness, and basic plumbing repair knowledge can suffice in situations which need a quick fix. 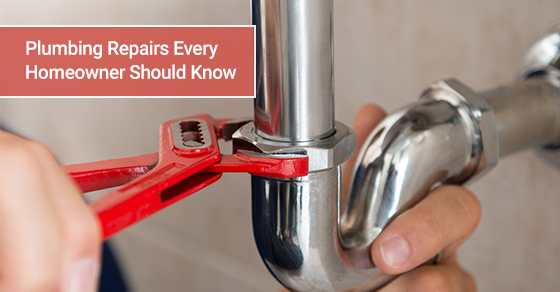 The following are the five most common plumbing repairs that you, as a homeowner, should know if you want to avoid the hassle of calling in on your plumber every week or so. Some plumbing repairs are so basic that they don’t even need 5 minutes to get fixed, provided you know i) where your main water pipe is, ii) how to turn it on and/or off as and when required. When it comes to a leaking pipe or a leaking faucet, or any given plumbing issue, you first ought to know where the main pipe is so that you can switch it on and off. This is the source of the water supply to your house and needs to be regulated according to the plumbing issue. In case of any leaks, big or small, this is where you need to rush to and turn the water supply off from the main source before you look at the problem yourself or call the plumber. In addition to knowing where the main source of the water supply is, you also need to know how to turn it on and off. This is pretty basic and usually requires simply twisting a knob left or right. Before tending to a leaking pipe or a leaking faucet, turn the water supply off in order to prevent your kitchen floor from flooding and the situation getting out of hand. Some of us live with a dripping faucet or a leaking pipe without tending to it in order to avoid the effort of fixing it or to avoid the expenses of a plumber. However, it’s probably not as difficult as it may seem. Depending on the degree of the leak, you can simply use the tools available at home to fix it in no time. Pipe leaks usually occur due to worn-out seals. They don’t need the services of a plumber and can be fixed in no time. Depending on the extent of the damage, you can either fix it using a pipe clamp or some putty. As mentioned before, you need to start the process by turning the main water supply off. Then, find where the leak is and either apply the putty where the leak is and allow it to set, or tighten the screws of the pipe by placing the clamps around the pipe. This should ideally solve any minor leaks. In case of major ones, you may as well go ahead and call the plumber. Dripping faucets are everyday phenomena and almost every home has experienced it at least once. If left unattended to, it becomes the source of round-the-clock water wastage and can also lead to the tap wearing out faster than usual. In case of a dripping tap, open the tap entirely and let any residual water run out. Unscrew the handle, the flange, and eventually the tap. Check for any signs of wearing out in the following parts of the tap: the O ring, the jumper valve, or the washer. Once you are sure which among them is the source of the problem, get a replacement from the hardware store and reassemble the tap accordingly. A quick tip on how to make your taps last longer is not to close them too tightly, as this will make the seal wear out faster. Your plunger is ready to be used in case there is a clogged toilet. However, make sure you wait till the water level has gone down as much as possible before you wield this very handy weapon. Follow it up by flushing it using a bucket of water in order to control how much water goes in. You may need some time and patience before you can put the plunger down. To avoid clogged toilets altogether, make sure you only flush down the stuff that can get sucked away in the force of the water without clogging the pipes. Also, make sure you don’t flush down too much at one go as this tends to clog the toilet. After a long day at work, all you want is a relaxing bath/shower under a strong stream of water to cleanse all the tiredness away. However, low water pressure may not always allow that. The good news is that they are an easy fix. First, you need to check if the water pressure is low just in one of the faucets. If yes, you need to then check for mineral deposits, which may be hindering water flow. De-clog the faucet of the debris by cleansing the filters and then reattach it. This should fix the problem and get the water running at a normal flow/pressure again. If the water pressure is low in the shower, remove the shower head using pliers to check for hard water deposits, a common problem with shower heads. If the water pressure is low in all the water outlets, then you probably need to give your plumber or your local municipality a call. You don’t need to go on making repairs throughout the house if problems surface one after the other. You can fix a host of plumbing issues all at once by simply replacing old plumbing fittings with new ones, instead of trying to fix them one-by-one. Worn out plumbing can lead to leaking pipes, dripping faucets and the like. If there is discoloration on the pipes, frequent leaks and stains, then it’s a signal for you to go ahead and give it a much-needed renovation. Plagued with plumbing issues that are hard to handle? Call Imagine Plumbing at +1-844-399-4670 or contact us here.